As you already no doubt know, Logan and I love a good story book and hopefully Harlow will take an interest in stories as she gets a bit older. For now though she's happy looking at the pictures. 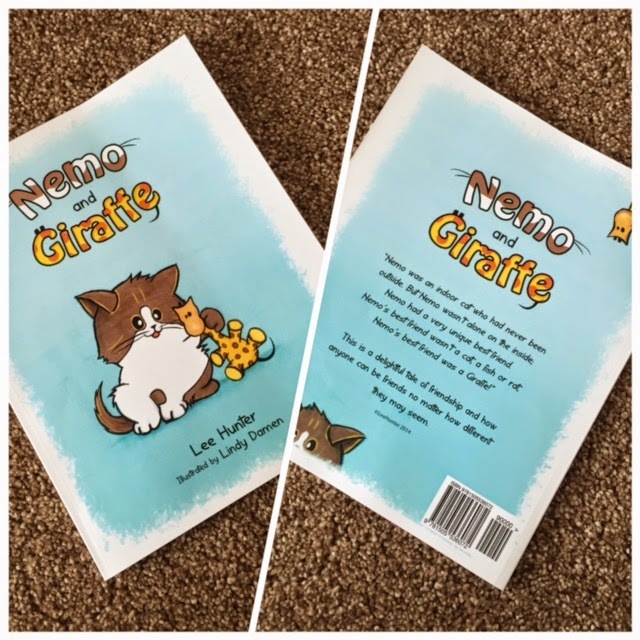 I was contacted by Lee Hunter, author of Nemo and Giraffe, not so long ago to see if Logan and I would like to review her children's book. It looked like a lovely book with a lovely story so I happily agreed and kept my fingers crossed Logan would like it too. 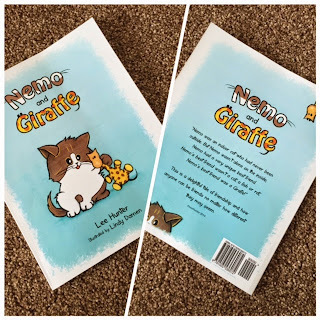 A little about the author, Lee Hunter, first: "I am the author of "Nemo and Giraffe", this is the first children's book that I have written and it is the first in what will hopefully be a series. "Nemo and Giraffe" is based on the life and antics of my own indoor cat, Nemo. The aim of this book and series is to help young children form positive relationships with cats and all pets and to learn how to care for them from a young age. I am currently a Childminder in Elgin, Scotland and work daily with children under 5 in the comfort of my own home. A great struggle for me within my childcare setting is teaching the children to be considerate of our cat, Nemo and how he may become frightened if they scream, jump or grab him and by promoting their awareness of his feelings they are able to not only improve their behaviour but also their awareness of themselves and others." Nemo and Giraffe is a gorgeous little story book with around 12 back to back beautifully illustrated pages on the adventures of Nemo the house cat and his best friend Giraffe (who by the way is a cuddly toy). The story starts by stating that best friends can look like anything at all and that no two best friends are the same. It describes how best friends can be boy or girls, big or small, hairy or scaly etc to emphasis that looks don't matter when it comes to being the best of friends. It then goes on to describe Nemo, the indoor cat, why he likes to be indoors and also that his best friend is a Giraffe so he doesn't feel lonely. Nemo and Giraffe move home together and get up to all sorts as any dynamic duo best friends would. Throughout the book Nemo's feelings are described when he encounters different situations for example how he is frightened of fire works or how happy he is to watch the birds with Giraffe. It's a great and simple way to introduce children to the idea of feelings and being a good friend. As I mentioned the illustrations are beautiful, they're very cute and child friendly, and they suit the book perfectly. Lindy Damen was employed by Lee Hunter to illustrate the book after Lee managed to secure funding through a successful Kickstarter campaign. So Lee has self published this book which is great and so ambitious. It's nice to see someone going after their dream, well done Lee. *Coughs* just to note Lee would love an agent and to have her next book in the series published by an agency professional so if there's anyone out there reading this that can help please do get in touch with Lee. 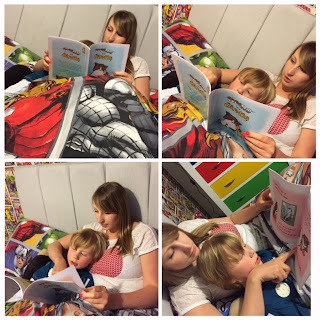 Logan was captivated by this book as you can see from the photo of us reading it together. 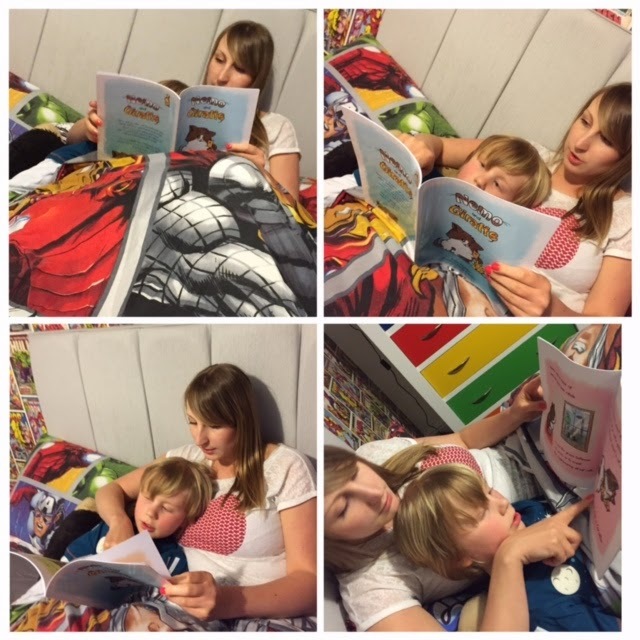 He loved the story and pictures to go along with it and sat entranced throughout. At the end we even discussed how best friends can be anyone and it doesn't matter what they look like, thankfully he fully agreed which was lovely. The story isn't too long either with sometimes only a handful of words per page so it keeps your little one interested and engaged as you're not taking forever to move onto the next page. The book can be purchased in Paperback (£4.99) or Kindle Edition (£2.36) from Amazon for whichever suits your family. I think the Kindle Edition would be a fab purchase for if you wanted to take on holiday. I know when we travel we always have to take bedtime stories so this would save much needed space. Overall a lovely book which is perfect for teaching children about their feelings, other people's feelings and friendship. This would be great as a good behaviour treat, Birthday/ Christmas present etc or if your little one is struggling to understand how to be a good friend then this is for you. Nemo and Giraffe play together well so sets a good example. Please visit Nemo and Giraffe on Facebook and Twitter for more information. I was provided with a copy of the Nemo and Giraffe book in return for an honest review. All opinions are my own. 0 comments on "Review: Nemo and Giraffe Book"